Classic chicken salad sandwiched between two halves of Whole Wheat Goldfish® Bread. 1. Prepare Chicken Salad USDA E-05 (omit bread) recipe according to directions. Reserve. Whole Wheat Goldfish Bread is made from 100% whole grains, is a good source of fiber, and is made with no high fructose corn syrup. Its crustless trademark Goldfish shape and soft texture throughout will help transform everyday sandwiches into exciting creations. Available in 1.5 oz. servings, 120 servings per case. 2. 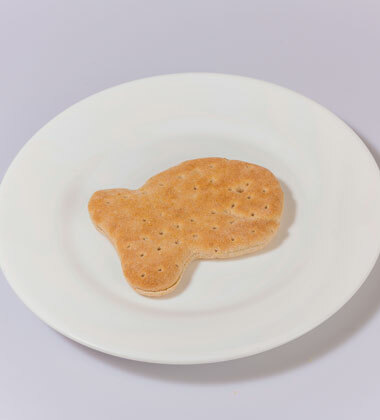 Split Pepperidge Farm® Goldfish® Bread- Whole Wheat sandwich bread. 3. Using a #8 scoop, portion 1/2 cup chicken salad onto one slice of bread. 4. Top with second slice of bread. Serve immediately. For a complete reimbursable meal, try serving with 1-1/2 cups of spinach salad, 1/2 cup canned peaches, and 8 ounces of low-fat milk. Approximate Meal Pattern Contribution for the total menu solution: 1 grains/bread; 2 oz. meat/meat alternate; 1/2 cup fruit; 3/4 cup vegetable(dark green); 1 cup milk.